Sometimes I just like to write about what's going on here at Chalky Towers, so here goes. I have two shows coming up in the next week, both for pretty high profile bands - 'Flight of the Conchords' and 'She & Him'. 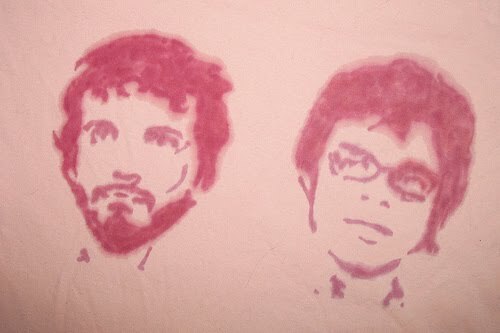 I've haven't seen either acts before and if I'm totally honest, I'm probably looking forward to the comedy factor of FOTC more than the 'cutsey' factor of 'She & Him'. The main reason I got tickets to 'She & Him' is because a) I love M Ward's guitar playing and b) it's on our wedding anniversary, and yes, I do have two tickets! Two very different concerts and neither having anything in common musically with the last act I saw, Caribou. Incidentally, I've decided my Caribou phase is perhaps a sort of electronic allergic reaction to having overdosed on folk music last year, anyone else feel this way? I'm not turning anti-anti folk but my electronic batteries just need a little recharging. In other news, my broad beans are doing well but the slugs have eaten my courgettes. Grrrrr.